After much deliberation (well, at least 1 week), and much Googling, I have chosen what I think is a pretty cool Camping Gadget of the Week!! The blurb says that it turns most water sources into potable drinking water in just 60 seconds. When you are out camping or hiking, we all know how important clean drinking water is, and this seems a very convenient and fast way to get such water. Its via UV technology which means that the Ultraviolet light destroys microbe DNA of all sizes (such as those nasties like Giardia and Cryptosporidiumwhich is a microscopic parasite that causes you to have intestinal illness, resulting in Diarrhoea, abdominal cramps, gas, malaise, and weight loss and these symptoms could last up to 1 month). The UV ceases the reproduction of the parasites, rendering them harmless. 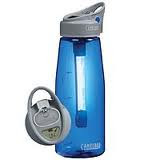 So you fill up your CamelBak Purification System bottle, put the UV cap on, shake and then in 60 seconds you have safe drinking water! At time of writing, it was only available in USA. Camelbak website says you should be able to get 3 bottles of water every day for 9 years, which is impressive. Depends on you and your needs. The benefits of the SteriPEN are that there are a large amount of models available to suit your needs, plus the pen can go into a number of different bottles - the CamelBak, you must use the bottle it came with (.75L CamelBak Tritan Bottle). We own SteriPEN Adventurer, and that has been a great purchase, and does provide peace of mind when drinking water but we would definitely give the CamelBak a try when it is available here, as I like the all in one option and the size of the UV light plus the recharging options from a USB is a great idea. For the time being, we will continue to use our SteriPEN but should I happen to come across the CamelBak in my adventures (or travel to USA anytime soon), I would not mind adding this to our camping box.